Cone Beam Computed Tomography (CBCT) is commonly known as Dental CT and is a highly promising potentially low-dose 3D imaging technique to visualize bony structures in the head and neck region for multiple applications in dentistry. In medicine and dentistry, the first and the most important step is Diagnosis, based on which the treatment planning and prognosis is determined. However, it’s tough to correctly diagnose what is barely seen - or not seen at all. And what is seen on 2D intraoral images can be limited, ambiguous and misleading sometimes. CBCT is an affordable, safe and powerful tool which gives information dentists need to diagnose with confidence every time. And most importantly it provides the “missing link” between a dentist and specialised radio-diagnosis. It fits the needs of both general and specialized dental practises. It provides for easy and quick image sharing, for better communication with patients and referrals. CBCT is commonly advised for various applications like Implant placement, pre and post root canal treatment, third molar extractions, impacted canines, bone morphology assessment, airway studies, trauma, cysts and tumours and many more. This imaging technique provides unlimited 3D views of the structure of interest at sub-millimetre resolution without any superimposition in less than 20 seconds. 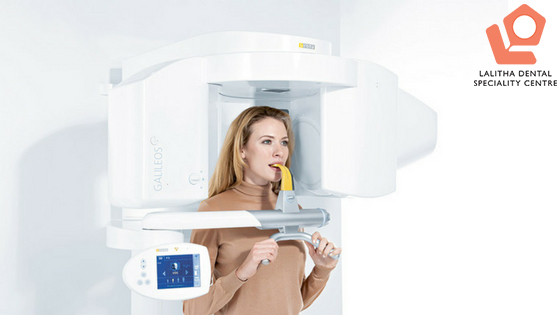 CBCT is similar to a medical CT in providing 3D information but with very important advantages like lower radiation dose, low level of the metal artefact, accurate measurements for dental purposes, and can scan small regions for specific diagnostic tasks. Most often, patients are referred to a third party imaging centre for CBCT scans, thereby involving time and effort for the patients. To get a diagnosis on the spot and mitigate the problems of the patients, the only solution is to have an In-house CBCT machine. We take pride in mentioning that LALITHA DENTAL SPECIALITY CENTRE is distinguished as the first Dental clinic in Bangalore providing an In-house CBCT imaging facility for its patients.